On 2nd January 1492 King Ferdinand of Aragon entered the city of Granada to recapture it from the Moors. This was the last Moorish stronghold in Spain and Ferdinand’s victory therefore brought to an end a period of Spanish history that had lasted since 711. Ferdinand ruled jointly with his wife, Queen Isabella. As she was the hereditary ruler of Castile, the conquest of Granada meant that the joint sovereigns were the virtual king and queen of most of Spain. 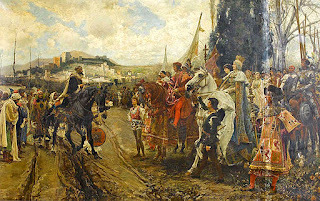 Granada had fallen to an almost bloodless siege that had lasted for nine months, although it was the culmination of an 8-year crusade by the Catholic monarchs to expel the Islamic Moors. When the time came, the former ruler of Granada, Boabdil, simply handed the keys to Ferdinand and prepared to set off for North Africa from where the Moors had come nearly 800 years previously. As he rode away, Boabdil stopped on a mountain ridge to look back at the city he had lost. Legend has it that he shed a tear and was rebuked by his mother for weeping like a woman and not fighting like a man. The ridge now bears the name “El Ultimo Suspiro del Moro” (“The Last Sigh of the Moor”). Ferdinand and Isabella now reigned supreme in Spain and must have felt that they could do anything they wished. When, later that year, an adventurer from Genoa named Christopher Columbus turned up and sought financial support for a voyage to the Indies by sailing westwards rather than eastwards, they were happy to oblige. They must have thought that they could do no wrong – the rest, as they say, is history.